The opportunity for 69 Valley World War II veterans to visit war memorials in Washington, D.C., through the Central Valley Honor Flight organization had an impact beyond those who went on the trip. Members of the Fresno State community came together before the three-day trip that culminated with a coordinated celebration for the veterans during halftime of the Fresno State football game Saturday against Nevada. Before the veterans left for the East Coast, cadets from Fresno State’s Army ROTC performed a small part to make the trip possible. Lt. Col. Lorenzo Rios, who commands the ROTC, said the cadets raised funds at several football games and other events for the all-expenses paid trip for the veterans. On the day the flight took off, 17 cadets, Rios and senior military instructor Donald Spock went to the airport at 3:15 a.m. on a school day to help send off the veterans. When the veterans returned on Oct. 31, about 600 people, including the Fresno State marching band and cheer squad, greeted them. One of the people who greeted them was Brenden Alfheim, president of the veterans fraternity at Fresno State and a veteran who served two tours in Afghanistan. The reaction took him back to when he flew into Texas as he returned home from his first combat tour as a medic in Afghanistan. “I was walking through the terminal and there were people all around us and they were clapping,” Alfheim said. “It was so loud. It was such a—whew— an experience to feel that amount of appreciation. Rios said it struck him that there were multiple generations of soldiers at the airport when the veterans returned from their trip. 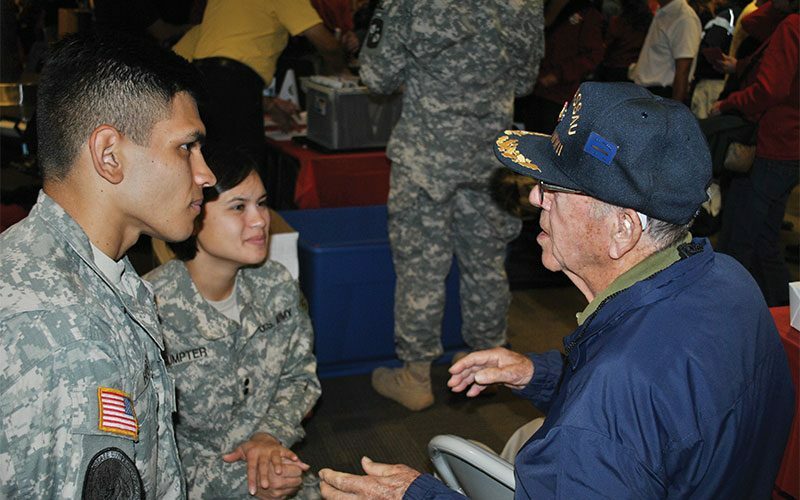 “We had veterans and active service members alongside cadets,” Rios said. “It was the old guard being saluted by the current guard and the new guard. It was a family bond. They embraced cadets as the new generation. They didn’t look at them as kids. There was no us and them. 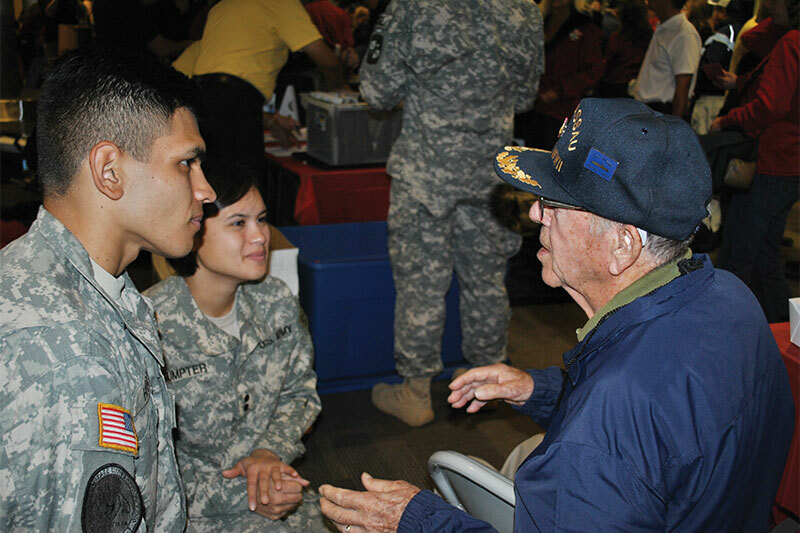 On Saturday, two groups of ROTC cadets worked on separate events for the veterans. Rios said one group put together a tailgate before the Nevada football game. Meanwhile, during the game the ROTC push-up crew coordinated with the marching band to time a salute to the veterans sitting on the field. After the game, Rios said they even drove some home in vans. Near the end of the night, Rios said another veteran turned to him in shock. Rios said the veteran’s response summed up why the work was worth it. “It’s because you think that way that you deserve it,” he said.